The Japanese Love Nature Too, a photo by timtak on Flickr. But is it a gaijin (foreigner) influence? 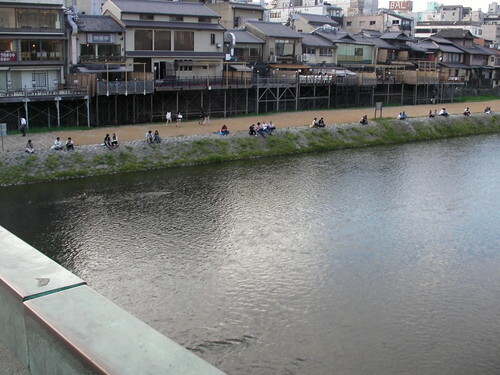 Kyoto is the only place in Japan were there are many restaurants along the banks of a river. In my city, despite the fact that there is a river running through its centre there is only one café and no restaurants on its banks and the one café does not afford a river view. Kyoto is the exception but then Kyoto is also the second biggest tourist attraction in Japan (after Tokyo) which has presumably been influenced by Western culture. Western tourists may have promoted the construction of restaurants along side this river. I think that other cities may achieve increased inbound tourism if they followed suit. I found that Kyoto citizens had a habit of ignoring red pedestrian traffic signals when there are no cars coming. In my experience, Japanese pedestrians wait, as is the law, even if there are no cars in other parts of Japan. I wonder if this Kyoto dwellers' behaviour is influenced by gaijin too.